To verify your TOKAY size, please follow the steps below. Have a friend draw a line tracing your foot (this might tickle a bit). You can do this by yourself, but you risk a slightly less accurate measurement. Now, repeat this step with your other foot. Step 2: Measure the maximum length of both of your feet. Record the length of the longer foot. 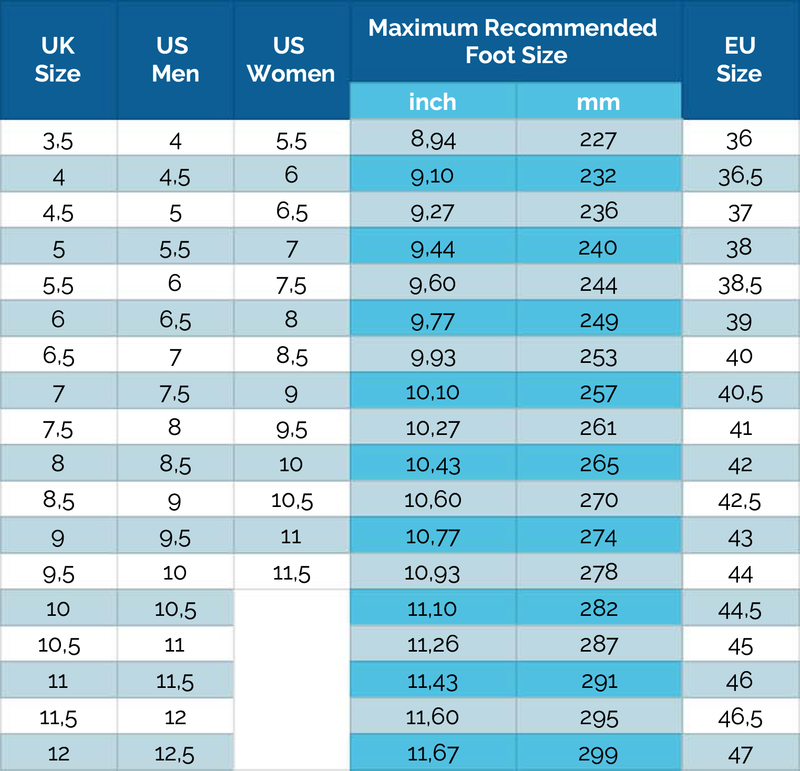 Step 3: Check your size in the chart below by choosing the shoe size with a “maximum recommended foot size” equal to or larger than your own maximum foot size. – if you have regular, wide or thin feet: don’t change anything that’s perfect. – if you have extra thin feet: consider choosing one size smaller for a better fit. – if you have extra wide feet: consider choosing one size larger for a better fit. If you are wondering if your feet might be extra narrow or extra wide, read the next question. If any question during this process, feel free to contact us via the contact form in the footer. How can I know if I have extra narrow or extra wide feet? First, measure the width of your feet. Follow the same steps as before, but this time measure the width of your feet perpendicular to the sheet of paper (so do not measure the width diagonally from widest point to widest point). 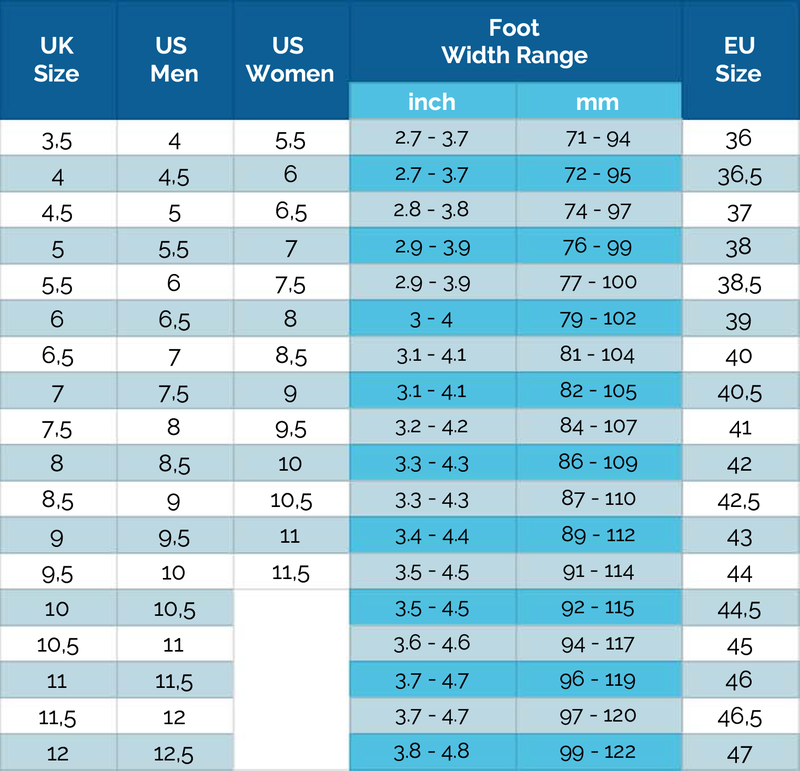 You can then read in the table below if your feet fit within the standard foot width range, if they are narrower or wider. If your feet are narrower than the standard foot width range, you can choose a smaller size, and if your feet are wider, you can choose a larger size. We recommend not deviating more than one size from the size you selected according to the length of your feet. Does TOKAY differentiate between men’s and women’s sizes? TOKAY produces a unisex shoe in a large range of sizes. We do differentiate between men’s and women’s US sizes, but only as a frame of reference for people used to working in those measurement systems. Men can have narrow feet and women can have wide feet, so we chose not to distinguish between the two with a men’s and women’s fit. Instead, the two pairs of insoles delivered with every pair of cleats – the thinner yellow insoles and thicker blue insoles – can be used to customize the width of the cleats. In what widths are TOKAY cleats available? TOKAY cleats are currently only available in one width. However, all TOKAY cleats come with two pairs of interchangeable insoles in different thicknesses – one thin and one thick – in order to customize the fit according to your feet. The thin yellow insoles gives wider feet more room within the cleats while the thicker blue insoles give average feet a snugger fit. These removable insoles also allows for users with orthopedic insoles to easily swap these into their cleats. Additional stitching and material reinforcements have been added in the cleats’ design to minimize deformation of the cleats through use. Some minimal stretching will occur, mainly upon initial use. Are TOKAY cleats made with animal leather? No. We use high quality synthetic leather which is of equal (or better) quality than animal leather and also easier to maintain. We also chose to use artificial leather in order to avoid contributing to the animal suffering inherent in both the leather and food industry, and we were very happy to find out that this choice would result in a higher quality product. What materials are TOKAY cleats made from? The outsole is made out of TPU (thermoplastic polyurethane), a plastic with excellent abrasion resistance. The upper is made externally of synthetic leather with an additional layer of TPU for extra abrasion resistance. The inner lining of the upper is made of a 3D Mesh for additional comfort. In the mid-cut model elastane is used for the sock. The insole is EVA (ethylene-vinyl acetate), a lightweight material commonly used as a shock absorber in sports shoes. Where are TOKAY cleats manufactured? TOKAY cleats are manufactured in Bulgaria. Why should I take care of my TOKAY cleats? Taking good care of your cleats will make them look better for longer, and (more importantly) it will keep your cleats in better working condition. They were designed and made to be durable, and taking care of your TOKAY cleats will help them to last even longer. How do I take care of my TOKAY cleats? Mud gets into the fabric pores and over time this affects the breathability, flexibility and therefore also the durability of your cleats. Simply use a wet towel or sponge to remove the mud off of your cleats after a muddy training or tournament. Do NOT use solvents to clean your cleats and do NOT put your cleats into the washing machine. This will moisten the inner foams and help the growth of bacteria. Encourage your cleats to dry naturally by placing them in a dry and well-ventilated area. Remove the insoles and let these dry separately. Insoles usually retain a lot of water and absorb most of your foot sweat. If your cleats are very wet you can also put some balled up newspaper paper into them to help absorb out the moisture. For many of us, just taking our cleats out of our bags after practice is a good first step in the right direction. Finally, use your cleats like cleats. Work them hard, but please do not walk on concrete in your cleats. This will damage the studs and might even sharpen them. While that might sound cool in theory, it can hurt quite a bit in practice. So stay safe, and change out of your cleats if you need to walk across an area of concrete. Why can’t I add an item to my basket? If a model (mid-cut or low-cut), colour or size is grayed out and cannot be selected, that means we no longer have this combination of model color and size in stock. Please contact us so we can tell you when your desired order will be available again. What forms of payment does TOKAY accept? We accept credit card or PayPal as standard payment options within our online sales platform. If you would prefer to pay by check or wire transfer, please get in touch so we can make arrangements. – 3 to 6 working days for any other destination. Delivery costs vary depending on the order and destination. All delivery costs will be calculated for you prior to checkout. We are currently still calculating some of the shipping costs. So, if you cannot find your country on the shipping list, get in touch and we will prioritize adding that destination. For orders of 10 pairs and over we offer free shipping to the United States of America, Canada and Europe. What is that Free Returns offer? During the month of May 2018, every order placed with delivery in Europe will be eligible to free return and exchange shipping. Customers who wish to exchange a pair of cleats should contact TOKAY via email at: info@tokay-ultimate.com. Once we receive the cleats and check their condition, we will proceed to refund the return shipping and ship the products as agreed to with the customer. TOKAY will ship the new pair back to the customer for free. We cannot stop the shipment once an order has been placed. However, once you have received the shipment, you can cancel your entire order or part thereof within 14 days of the date of receipt of the product(s) and return the products back to us. There is an issue with my cleats or my order, what should I do? Pictures of the issue and general pictures of the shoes.